Was it worth $65 to see sign language interpreter do a hatchet job of interpreting the wonderous words of YES? No, it certainly was not. Was it worth the $65.00 to see Yes be humans? Yes, for this 20 year old, indeed it was. For you people that has complained of this show both on this site and other Yessites, just chill. While everyone's entitled to their opinions, you just seem very unappreciative of the fact Yes is a band of human musicians, not supermen. Yeah, they screwed almost every songs, but so what! I had fun. To watch them screw up and handle it in a professional way and as a joke was the best thing for me to see from this band. I've seen them 3 other times (the last time prior to this was 3 months before in WPB) and they seemed to get better everytime I see them. Steve hasn't been THAT animated since seeing him on the Yessongs video. And his solos weren't replicas of past solos. He was actually doing a little more improvisations on each of the songs (well except for HOTS, since there is no guitar solo). The same goes for Wakeman on Awaken. This was a really great show to watch and hear. As for the interpreteting, and I have the rights to criticise them because I requested them. One word: Awful. And it's not their fault. It's Ruth Eckerd's. They showed up late for starters. The set list can make the reviewers and interpreters for D/HH (deaf and heard of hearing) go bonkers. Even worse for the certain audience member that is deaf/hard of hearing and you're trying to tell the interpreter what song is what when they haven't the darndest idea. I should know because I was that certain audience member. I'm 20 and have a mild to severe hearing loss and requested the interpters for the show. Now, given that they had a week to prepare for this, I was still expecting something that enhanced the show for myself. I say this because I did the same thing two months before when Yes came to West Palm Beach, though different interpreters. The interpreters for that show had a few days' notice and I had to email them the approxiamate set list (thank goodness for Forgotten Yesterdays) and mail out two cds of what was being played for the show. 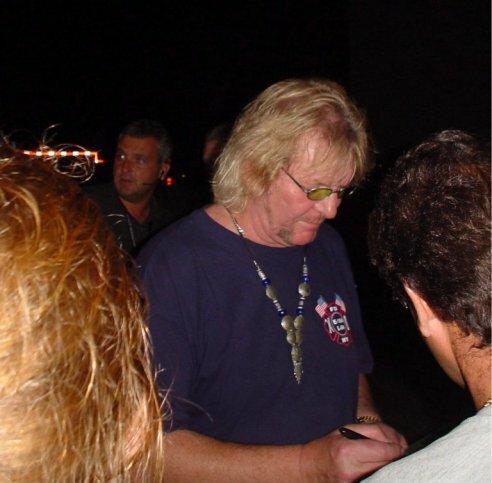 Despite that, they did a wonderful job and even got recognition from Jon Anderson during Magnification. 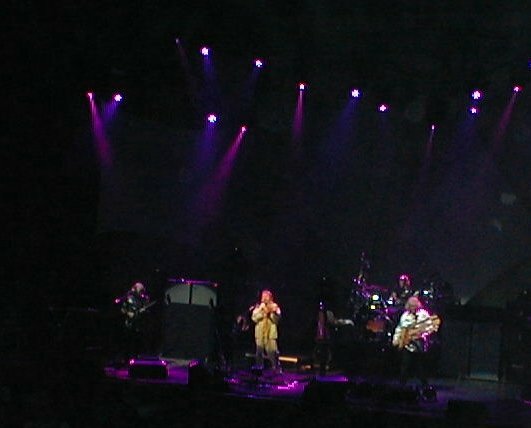 The interpretation at that show enhanced the Yes concert experience. However, for this show, I was less than pleased. Overall, the interpretation was mediocre. One of them did an ok job, the other was just not there with the music. And they even kept signing when one of the Yes member took a solo. Now, this was Ruth Eckerd's own doing since I originally requested two very exceptional interpreters and they refused use them. 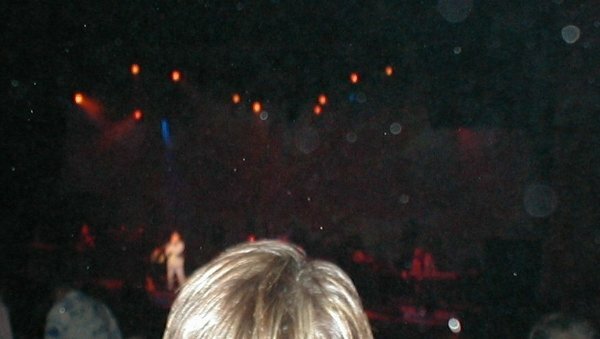 The other problem (and I know I should probably be writing to Ruth Eckerd)is of where we were seated. We're seated close to the stage, but it was with distruptions. To have people who couldn't hold their bladder get up and walk infront of not only me, but the interpreters was very frustrating. So, as a whole, the show was not worth $65 as far as the interpreters goes. 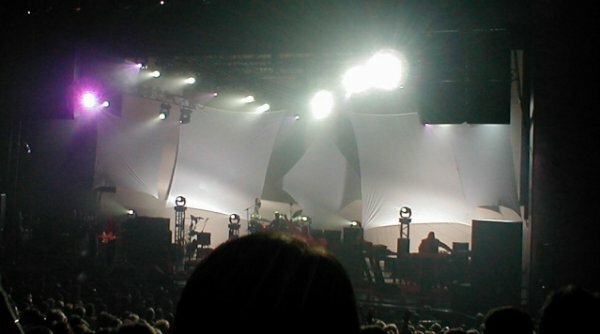 The only thing that was worth spending that much money to see my favorite band play was the music itself. Regardless of how much they screwed up on certain songs like Starship Trooper, (which was very amusing and I forgive them being that it was the opening night of the tour. ), it was still worth it just for that. This show was in such a great venue. Unfortunately, I got my tickets three days after they went on sale and we were in row GG, but still better than when I saw them two years ago in West Palm Beach when I was outdoors and at about twice the distance. 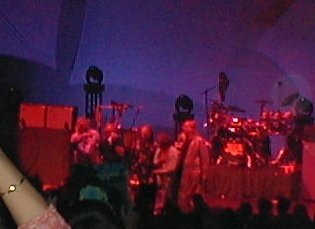 Maybe it was the place I was sitting (off to the side) but the sound seemed distorted in the beginning of the show, but then got better. I was wondering if the set was going to change from the first leg of the tour. I was surprised to hear Starship Trooper in the third spot and well as CTTE and Long Distance Runaround! I guess they are experimenting with a new set list. Don't be surprised to see it change again in the next few shows. 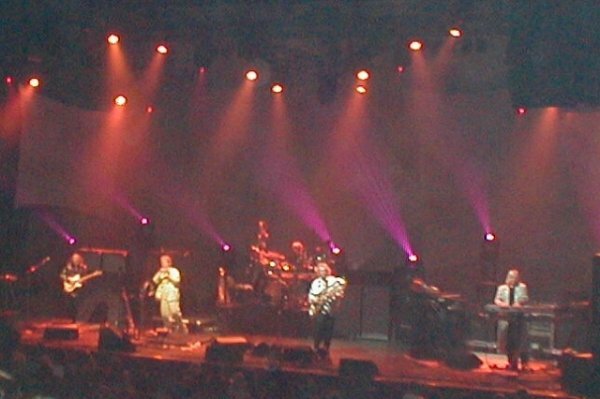 I saw YES for the first time in 1980 on the DRAMA tour. 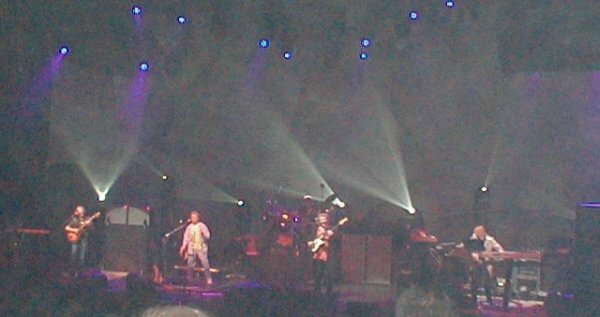 Anderson and Wakeman broke up the band shortly after we bought tickets. 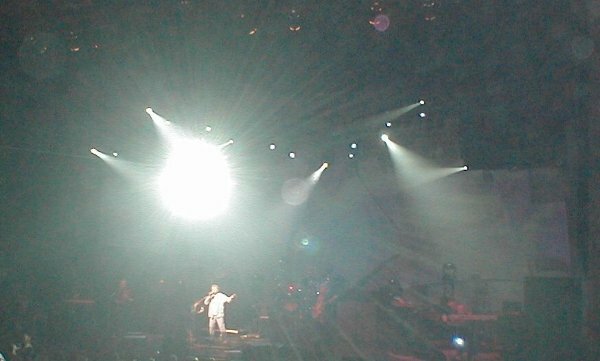 Then I saw the 90210 tour twice in a year and then MASTERWORKS 2000. 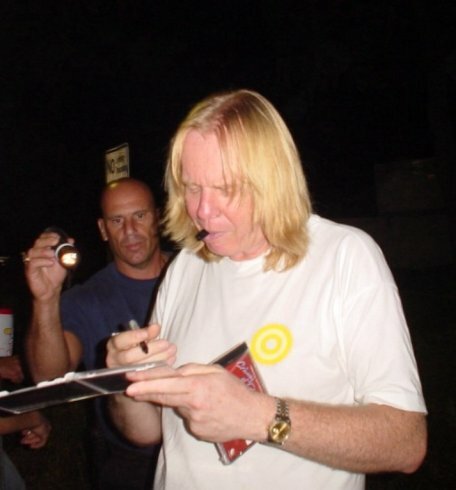 I've been waiting 22 years to see Rick Wakeman in the classic lineup! I can't decide if I liked the show at West Palm Beach better. 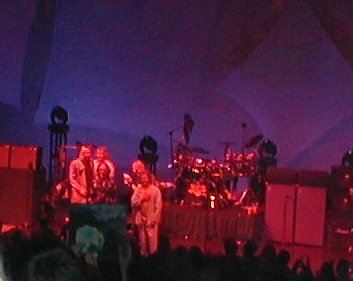 The set list was definitely better, but with Rick Wakeman in the band and with the songs I've never heard live before, this show was great too. There were quite a few technical glitches and the band wasn't always together. Jon got a few words wrong. (In CTTE, for instance, he sang "Passing paths that climb halfway into the SKY" instead of INTO THE VOID). But seeing as how it was the first show with over a month off, that is understandable. 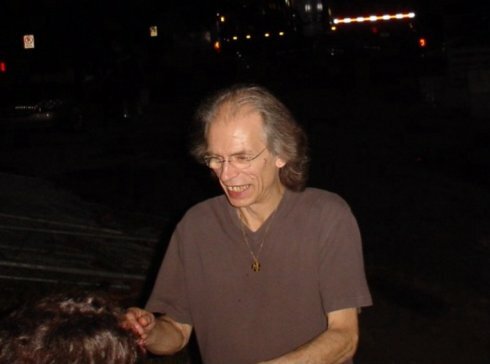 "He (Steve Howe) looks like a mummy." "Why are there only old people here?" She did like Rick Wakeman's hair, Rick's playing, and Jon's singing. She did say that Steve Howe is very good on guitar. I tried to convert her, but to no avail. She's just not a progressive rock fan. The biggest guitar bands in Venezuela are Led Zeppelin and AC-DC (so you get the picture). We, at 40 and 38, were quite young compared to most of the fans. That should tell you something. Their new stuff isn't really "progressive" any more. Jon keeps promising that the next thing they do will be really different. Maybe if YES would play more salsa? Some of the Latin/Reggae influenced music that YES alumni have done is their best material of the last 20 years. It would be truly great if they would do a tour that had several songs they've never played before live -- a show of real classic oddities from the first two albums or something from AWBH or DRAMA -- or why not a great "lost" YES song such as A VENTURE, TO BE OVER, PARALLELS or RELEASE, RELEASE -- why not more solo material? And so on ... you get the idea. Why can't they do what King Crimson or The Grateful Dead did in later years? That is, break up into smaller units in which to create and improvise new material while touring. Why not: Anderson, Wakeman, Rabin, Bruford, Levin -- or Anderson, Howe, Bruford, Moraz, Levin -- or how about Anderson, Squire, White, Howe, Downes? And so on, you get the idea. They seemed to be going in that direction a few years back, when there were two YES units, but then they tried to reinvent the wheel. If YES is to be lasting institution, then this line-up either needs to produce some CLASSIC new material or they need some new blood. They have always had personnel changes bring them their better albums. Repeats of the same line-ups tend to weaken their creativity. 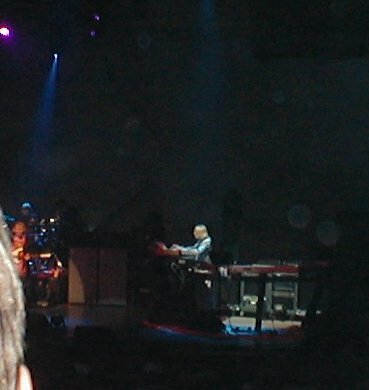 Rick Wakeman performing Close to the Edge and Awaken. Steve's and Jon's solos were first time ever performances. 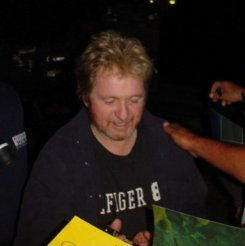 �The first day of the tour is like walking a tightrope�, singer Jon Anderson told his fans at the 2,100 seat Ruth Eckerd Hall in Clearwater FL, near Tampa. Dressed in a jogging suit, the bearded Anderson appeared rested, tanned, and fit after a one month layoff. 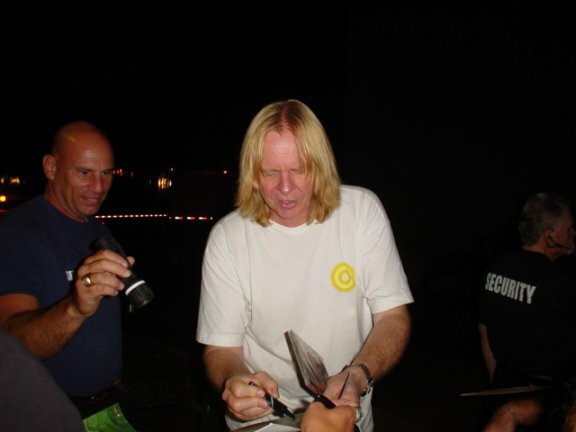 Likewise keyboardist Rick Wakeman appeared to have benefited from the rest, appearing slightly heavier and sunburned, but far less haggard than at the end of the tour�s first leg. 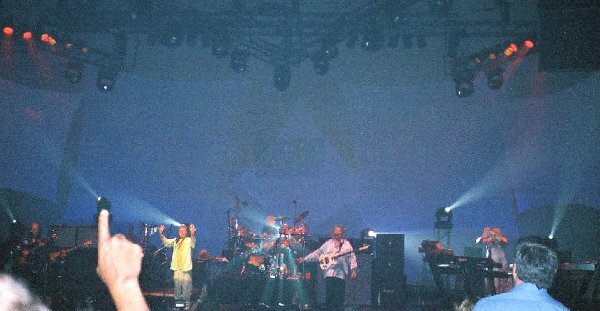 The group had rehearsed for several days at the small but elegant concert hall, putting together an entirely new show, and inviting locals to check it out before embarking on the second leg of their 2002 tour. Siberan Khatru remained the opener, but altogether tighter, the band seemed determined to keep it from becoming a throw away warm-up number this time around. 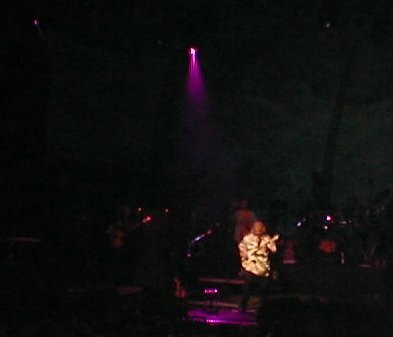 Steve Howe was particularly impressive, dressed in a simple star-covered t-shirt and blue jeans. He continued to push the mathematical and tonal possibilities of his guitars to their furthest extremes. 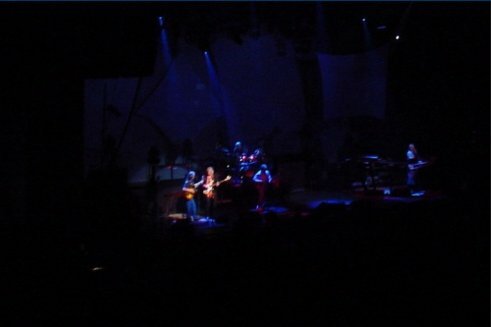 His audience, many of them skilled guitarists themselves, have never seemed to be able to figure him out, in large part because Steve is always looking for new and more elaborate ways to play the classic Yes material. Next came Starship Trooper, and it was here that Yes took the liberty to try and get loose and warm-up. 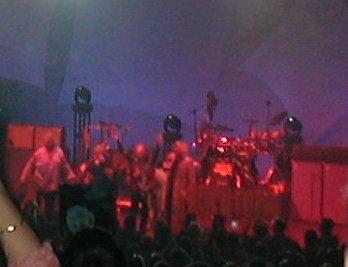 However it fell completely apart when someone missed a cue and the band members one by one stopped playing until it all ground down to a screeching halt. Standing momentarily in silence, the band members looked at one another and cracked up laughing. Then the crowd starting laughing too, and of course quickly forgave their heroes. Yes restarted the song, and finished it with an all-out jam on Wurm. Then Jon apologized in advance for In the Presence Of, knowing his audience would dread hearing it almost as much as he dreaded singing it. �The album is already becoming hard to find�, he groaned, referring to the poor-selling Magnification. Rick did his best to patch it up, but even his noble efforts couldn�t save the less than spectacular new material. With We Have Heaven/South Side of Sky, Yes came roaring back. Jon asked the crowd to sing with him on Heaven, and South Side totally ripped, provoking a standing ovation. Steve�s solo for the night was a brand new ragtime piece performed entirely on acoustic guitar and reminiscent of The Clap. So much so that everyone seemed to anticipate at any moment he might actually break into The Clap and cause an explosion of applause. Sadly, familiarity was not to be our reward for toughing out the brave new material. However, the best was yet to come! Unquestionably, the finest event of the night was the awesome Close To The Edge. This piece alone was worth the price of the ticket times three. (If you�ve only seen the Igor version, you have not seen Close To The Edge). Rick Wakeman was astounding and Steve, Jon, Chris and Alan no less as well: as tight and as potent as on Yessongs. However, we greatly missed was the rolling dry ice effect on I Get Up, I Get Down. Please get a dry ice machine! Then we�ll all think we�re in heaven again! Those hokey video effects just don�t cut it. Perhaps this is a good time to make a case for the return of Roger Dean. Please bring back his wonderful translucent fiberglass lighted sculptures. Roger is the 6th member of Yes and without the visual dimension that his art provides, Yes is simply not as good as it can be. Steve once told me that Roger is a great personal friend of his, so why can�t these two get together and work on a new stage backdrop or something? And while we�re at it how about a great new concept album to go with it, Keys to Ascension was the album that could have been, if only Eddie Offord�..Ooops! Must have been dreaming again! Wake me up! Starship: Stopped sort of...they covered but still screwed up. Low energy, no magic. solos were ...blahhh. Southside: Good...but better in August. some were surprised to hear it. Steve solos: Natural Timbre and something else....different and good as always. Master. Jon's "Show Me": Sounded better than before. HOTS: Disaster. They completely blew this. Once they got it back, they lost it again and blamed each other. Funny old men! Mag: good..sad that they trash this album.. great songs never see the light of a stage. Long Distance: with Chris and his solos that never change.....but still good. Master. Awaken: Jon's harp is for auction..but was on stage tonight. Best song of the evening as far as technical abilities for all. 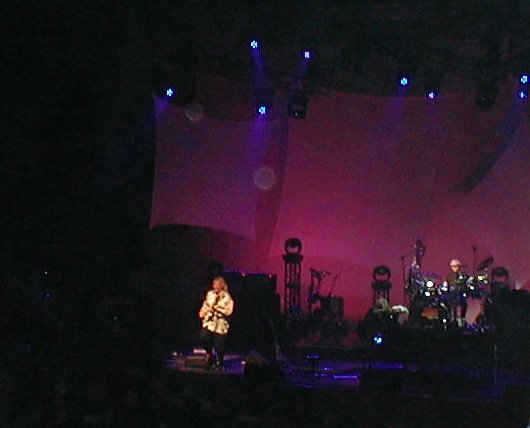 I have seen Yes in concert about 40 times since 1974. No other band or group of guys has ever thrilled me like they have. I have always traveled to see them. Paid all I could over and over. Not anymore. I will return to this venue for a concert but I refuse to pay for a Yes rehearsal again. This is a tired band grabbing all they can while they can. That's OK by me. "Why not?" ...is their attitude. From the sound of Jon's voice, it appears this is the last stand. The power is gone. It'll be sad to see them play small bars and county fairs in the very near future. Could they continue on? Sure... but they'd rather re-hash the same set list and worn-out banter. There were glimpses of past glory and at times they portrayed their mastery of the music and instruments but they were so few and far in-between it made me cry. Chris can still play. Steve, while very antimated and being the Steve we all know and love, is having difficulties connecting the dots. Rick is still learning "his" parts. Alan looked like he was waiting for the novacaine to kick in from the dental surgury he was having. Also, for some reason, it made me cringe to see them all wearing the same clothes as last tour (summer of 2002)Especially Jon. What the hell has happened guys? Watching Yes last night was like watching your aging grandfather trying to get off the seat-worn lazy boy and walk without his cane. Sad, indeed. I have many wonderful memories of this band and their music. I'll miss them. The venue was small, the songs were big, and the concert was magical. I was surprised that Yes played lots of 70's stuff, to my delight. With Rick as the keyboardist, they wanted to play things that especially featured him, and they did. He played like he always does - with flair and preciseness. Steve was right on too, and Alan didn't miss a beat - great rock drummer that he is! Jon was a bit upset at times - the lighting wasn't right at the right times, the effects weren't where they should have been, and the band was, how shall I say, a bit out of sorts. This being the first of the second leg - a few mistakes were made, though they were fun, because the guys were *REAL*. When playing Starship Trooper, someone was out of step, I'm not sure who, and they stopped, mid song, but Steve picked it up at, "Loneliness is a power that we posess to give or take away...", when Jon said, "You can play it!" 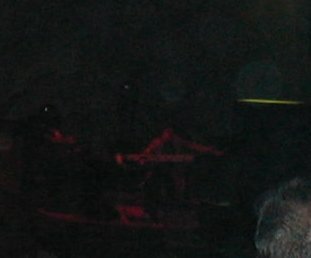 Then, at the end of the show, after Roundabout, Chris raised his guitar over his head, as he usually does, and the band assembled at the front of the stage for their bow, and Chris lowered his guitar, and hit Alan right in the nose - blood everywhere! What a sight! 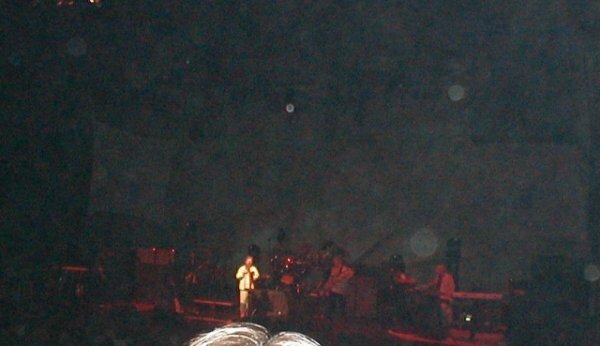 BUT - The guys are playing as well as I've ever seen them (my 37th concert), but they need to fire the lighting guy. 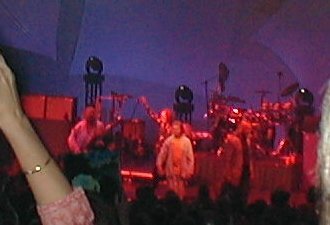 Overall, one of the *BEST* Yes concerts I've seen! Welcome back, Rick, Happy Birthday, Jon, strong solo Chris, Steve's as precise as ever, and Alan, you're the greatest rock drummer ever, and I hope your nose heals fast! What a great show!! !I just Hope Alan's schnoze is ok!! !Ice it down buddy!! !I was lucky to snag front row seats right in front of Mr. Squire.My brain is still vibrating! !I haven't been that close to the band since Roosevelt Stadium '76!!! !Close To the Edge was a real treat !!! I will be on a high till Christmas with that one!! !The crowd was fantastic!! !A million times more energetic than West Palm.Jon said he didn't get to see any lightning in Florida this time around.i wanted to yell to him "Go check out our hockey team!!! "Thanks guys!!! Just arrived back after their opener, and what a time we had! I'm too bushed to give many details, except to say that each and every song ended to a thundering standing ovation. They were all there. They were all great. It was everything you'd ever hoped it would be! 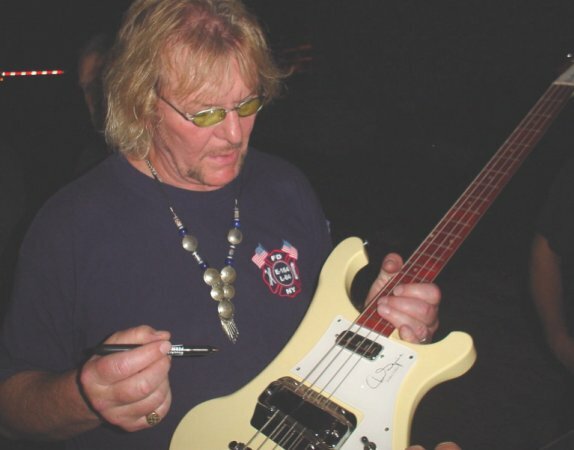 One sad note.... At the end of the encore, when they were all coming down to the front to take a simultaneous bow, Chris Squire was taking his bass off and accidentally popped Alan White in the nose. Much blood, but they all took a bow anyway. This probably explains why we didn't get them out a second time. The crowd was certainly up for it. One of the best crowds I've ever seen, by the way. Well,.... I hope it ain't a broken nose. Alan will sure look funny decked out like Geraldo Rivera for the next few dates. 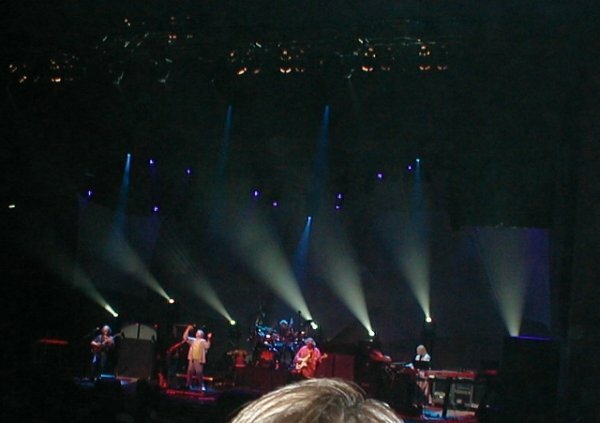 Another typical great show by Yes! I saw the August West Palm show and there were some differences. But overall it was the same quality perfomance. The venue, Ruth Eckerd Hall, is an acoustic heaven. The sound at my eighth row center seat was superb. So superb you could hear the few flaws clearly. It is a treat to be able to listen to each instrument with great clarity and no distortion or echo. I wish more shows were at this place! Jon forgot the words in the middle of Starship Trooper and the whole band had to stop. Pretty funny and Jon cracked that it had been a long time since he last sang the song, "like an hour ago at rehearsal"
The guys play well but seemed a tad bit flat for the first half of SK. Probably indicative of a long break in the tour. But overall they were very tight and appeared in a good mood with good energy. And by the end they were clowning around quite a bit. 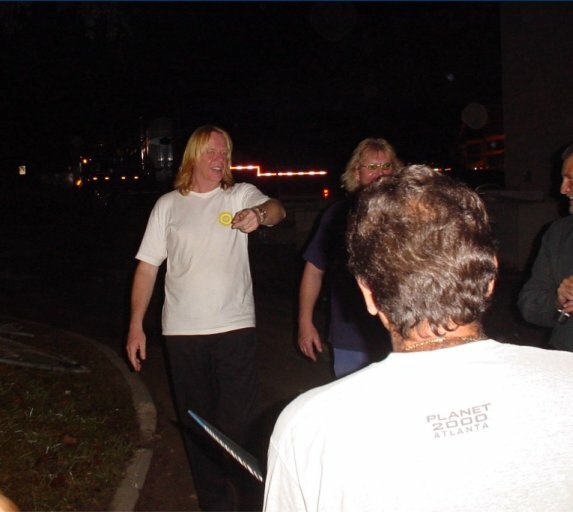 After Roundabout when the guys were getting together in front of the drum riser for their final bows, Chris swung his guitar around and accidentally bopped Alan in the nose. They were laughing about it even though it was bleeding and he had to keep a towel over it for the final goodbye's. Several times Jon appeared frustrated at the light techs not getting some effects right on the backdrop. Even when frustrated he remained calm as always and seemed to be poking fun at the guilty party with funny hand gestures. And the sold-out crowd was extremely enthusiastic. All songs were met with standing ovations and the band seemed appreciative. 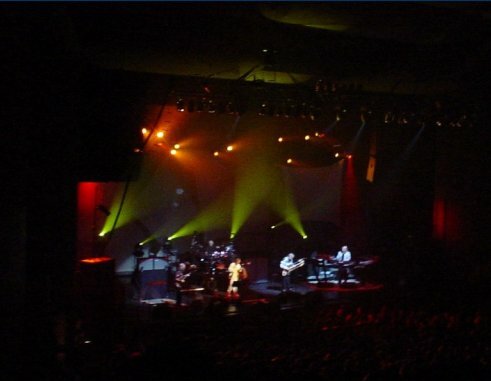 Yes began this leg of the tour at Ruth Eckerd Hall in Clearwater, Florida. It's amazing to me that they've never played there before in all the times they've been to Florida. Ruth Eckerd is considered the finest small concert hall in the Southeast and anyone who's been there knows why. The sound there is incredible and tonite's Yesshow was no exception. This isn't the first time I've seen Yes, but it's the first time at the beginning of a leg of a tour I've seen them. It was definitely interesting to see if they'd change the setlist from the summer, and finding that out firsthand instead of reading it on the net was refreshing. And they did change it, not a lot, but some. It was pretty much the same as the summer except they swapped out America for Starship Trooper, and the Revealing Science of God for Close to the Edge. They played Long Distance Runaround before Whitefish, and encored with only the long version of Roundabout, with Yours is No Disgrace dropped. With the exception of Starship Trooper, which didn't have a train wreck, but a slight derailment about 3-4 minutes in, the rest of the songs were pretty much flawless. Steve, Chris, and Alan all were spectacular, Jon sang like an angel like usual, and Rick was amazing. I love RSOG as much as anyone, but I'm glad they played CTTE instead. 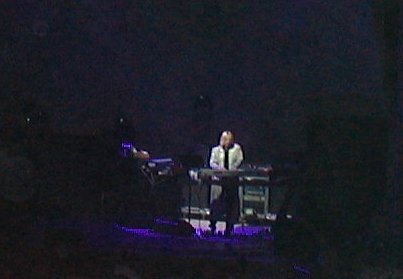 I can die and go to (we have)heaven, I got to see Rick Wakeman play on CTTE. Rick still had to put on glasses and read from sheet music on In the Presence Of, and Magnification, but was still great. And Awaken, OMG!, awesome as usual, and Chris with that triple neck bass! p.s. to my Yesfriends from Atlanta (Don and Joe?, I'm really bad with names) I met in West Palm Beach back in August, did you come to the show? If you didn't come, enjoy the show in Atlanta tomorrow, I know you guys will definitely be there. p.p.s. And if Whitney Johnson from WDAE, 620 the Team was there, I know you're a big Yesfan, I hope you enjoyed the show. And remember, all people named Johnson are a hell of an athlete, not to mention all Yankee fans are jagoffs. YES RULES! Everyone going to the upcoming shows, enjoy them!